With an election just 3 days away and Labour’s manifesto promising to reverse Royal Mail’s privatisation and re-nationalise it, we thought it would be interesting to do a quick review of how privatisation turned out. 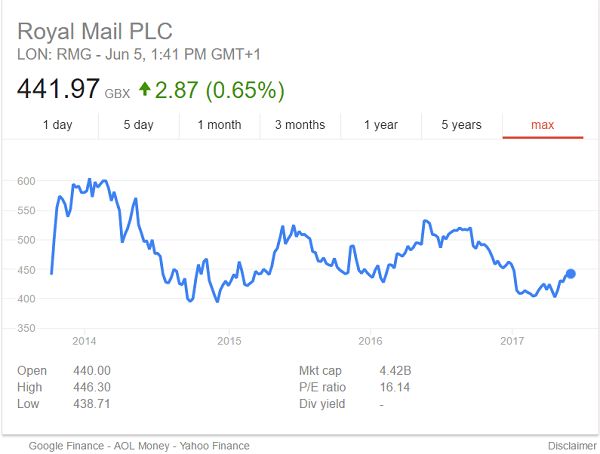 As of 5 June 2017, Royal Mail’s share price stands at just over 440p per share giving it total market cap of just over £4.4 billion. This is substantially above the 330p shares initially sold for on 11 October 2013. But interestingly, it’s almost exactly the same price shares ended up at on the end of the first day of trading. On paper, this means that the UK government sold Royal Mail for around 75% of its true value or £3.3 billion instead of £4.4 billion. So it would be fair to say that they lost (or to be more charitable failed to realise) £1.1 billion on privatisation. Although, this amount has fluctuated quite widely over the past three and a half years. At the peak price of 604.50p per share on 17 January 2014, Royal Mail was worth just over £6 billion. And at its lowest point of 393.60p per share on 12 December 2014 it was only worth around £3.9 billion. So the theoretical the amount lost has been between £2.7 billion and only £600 million. In reality the situation is also little more complicated since the government did not in fact sell all its shares in one go. Initially, it sold 60% of its stake raising £1.98 billion and gave 10% to Royal Mail employees. Then on 10 June 2015 it sold 14% of Royal Mail (half of remaining stake) for 500p per share (above current price) and gave an additional 1% to Royal Mail employees. This raised an additional £750 million. Finally, on 13 October 2015 the government sold off the remaining 14% of Royal Mail it owned and gave an additional 1% to employees at 455p per share (around current price). This raised a further £591 million. In total, the government ended up raising £3.3 billion but also gave 12% of Royal Mail to employees. Therefore, if grants to employees are excluded the government only lost £572 million, based on the current share price. The above also fails to take into account any dividends paid out to Royal Mail shareholders that would have gone to the government during the past three and half years. Therefore, Royal Mail privatisation can hardly be called a success from a taxpayer point of view. However, given Royal Mail’s rather volatile share price since privatisation, re-nationalising it carries its own risks. Overpaying for it would just add insult to injury.